Negotiators for the United Kingdom and the European Union agreed on the draft text of a deal for Britain to leave the bloc, a spokesperson for Prime Minister Theresa May’s office confirmed Tuesday afternoon. Downing Street says the negotiators settled on the technical terms for Britain’s divorce from the EU and that officials on both sides will review the plan for final approval. British cabinet officials are set to meet Wednesday afternoon to consider the draft agreement, May’s office said. Reports of a potential deal come as May’s government faces enormous pressure to craft a workable Brexit deal before the end of November. 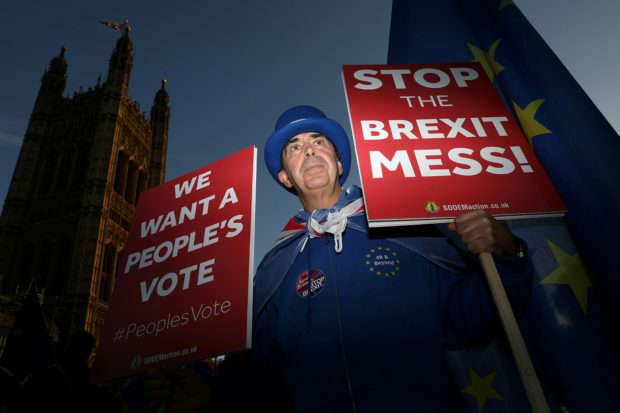 Britain is set to formally leave the EU on March 29, 2019, with or without a deal, but negotiations must conclude soon in order to give Parliament time to ratify an exit agreement. May has also come under fire from leading supporters of Brexit within her own conservative party, who have accused her of trying to sell a “soft” Brexit that doesn’t guarantee independence from Brussels. They contend that May’s so-called “Chequers” plan keeps Britain bound to EU tariffs and regulations and prevents it from striking bilateral trade deals with other countries around the world. Nigel Dodds, the leader of the fervently pro-Brexit Democratic Unionist Party (DUP), said it will be a tall order for May to win backing for her plan in Parliament. “The trick will be for Theresa May, can she satisfy everyone? It is going to be a very, very hard sell, I would have thought, but let’s wait and see the actual detail,” he told BBC Northern Ireland, according to Reuters. “The crucial issue is going to be what happens when it comes to cabinet and when it gets to parliament. We haven’t seen any details, we’ll see what happens,” Dodds added. Even if the British cabinet backs the draft agreement, it would still need to be approved by all 28 EU nations, plus the British and European parliaments.